The Japanese Self-Defence forces are hard at work in Sendai but in evacuation centres across the stricken area, normal life is still hard to come by. 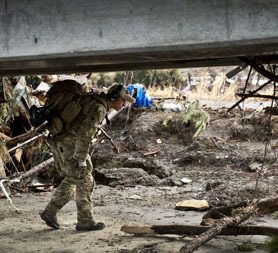 US Marines are busy removing the hundreds of vehicles that litter what were the streets of Sendai. The airport there was almost completely destroyed by the tsunami, but already the runway has been cleared by the US military and the Japanese Self-Defence Forces. A total of 263,915 people are in shelters around the country, according to the National Police Agency of Japan. As well as those made homeless by the tsunami, there are those who have had to move because of danger from the nuclear power plants in the north east. The evacuation area around the plant was moved from 10 km to 20 km on March 12th and since then around 177,500 residents have had to be evacuated. Hundreds of thousands of people are without water or electricity, including many who are in the shelters. On the day of the earthquake I'd been at the dermatologist with my daughter. I'd just returned home and was changing her nappy when the earthquake struck. The house was really shaking hard, and I thought it would be safer outside. Normally I'd have stayed inside, because that's what we're taught to do, but the ground was shaking so hard that I thought I'd be safer outside. I ran out with the baby- I didn't even have time to put on a new nappy. I was about to go back into the house to get some things, when I heard the Tsunami siren ringing. My mother shouted at me not to go into the house, and we started running to higher ground. I now know that my house was completely destroyed and we've lost everything. I had only have the clothes I was wearing, but Mion was given some baby clothes yesterday.Life in evacuation centre is very hard. We've been here for ten days and I'm very concerned about my babies health. For the first nine days, we had no hygiene supplies given to us at all. Yesterday we got three baby wipes- not packets but individual sheets and a couple of cans of milk.There's nothing to sterilise the baby's bottle with, and I haven't washed my hands for days. I tried to go to the city to buy some supplies, but there is nothing in the shops. I'm very worried about my daughter, especially because she suffers from poor health. Even before the disaster she'd been going to the hospital twice a month, and there's no telling when we're going to be able to go again. Mion is very shy, and it's really upsetting her living here, with so many people around all the time. We have no idea when we will leave here, or where we will go.